Spring this cheery, heartfelt gift on a loved one and a smile is sure to sprout. 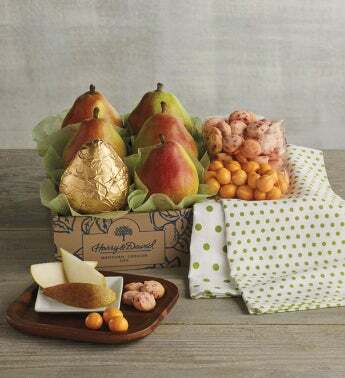 We've captured the flavors of the season, with a half dozen of our juiciest pears, chocolate-covered apricots, and zesty lemon raspberry button cookies from our bakery. The kitchen towel with a cute polka dot design will serve as a bright reminder of your thoughtfulness.